When humans first made clothing is the subject of modest (and obscure) debate among scholars. In the most often told scenario the first humans to wear clothing did so in Europe as a means to cope with colder temperatures and the loss of hair (an interesting subject in and of itself). The trouble with understanding the origin of clothing is that most materials used to make clothing degrade in the environment, particularly under warmer, wetter conditions, particularly as one considers points further and further back in time. Those who study clothing typically do so in the context of value as protection from the cold or its cultural roles. But once we began to wear clothing it almost certainly had another effect too, it altered the environment to which the microbes on our skin were exposed. Think about what happens when you wear shoes without socks. Your feet stink. The shoes stink. The stink is (we suspect) the result of changes in the microbes living on and adjacent to your foot skin. Such a change is interesting in and of itself in as much as it affects how we wear shoes (and how unpleasant a plane ride is with someone who has taken theirs off). But what is perhaps missed in most tellings of this story is the bigger picture. Fabric applied with a bandaid. Our skin microbes help to kill pathogens that land on us, their odors attract (or fail to attract) deadly mosquitoes, and their odors attract (or fail to attract) loved ones near to us. If, in putting on clothes for the first time, we altered these skin microbes it may have had huge implications for human health, culture, and well-being. But any such implications have gone totally unstudied, so has just which microbes live in clothes. Here we propose to get started in an effort to change all of this, we are beginning a study of the microbes of clothing. It will be a broad based effort (with studies of ancient clothing in museum collections, studies of traditional clothing around the world, studies of the factories where clothing is produced and more), but the very first humble step is just have a group of people wear tiny bits of fabric of different types (really, really, tiny) and, in doing so, to see what grows on those tiny bits of fabric. Fill out the form below providing your name and contact information. Soon after you complete this form (in about a week) you will be contacted by email about wearing these tiny bits of fabric. 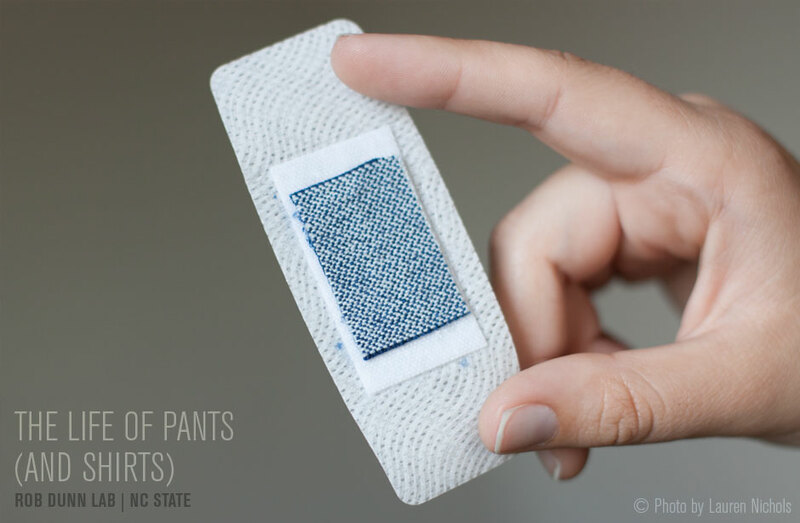 Fill out a consent form to participate in this project and then you will be given a kit with the tiny bits of fabric to wear from the scientist working on this project. Wear the tiny bits of fabric and then give (or send) these samples back to the scientist. Find out which bacteria was on the samples you wore. You will receive an email with your results and it will include pictures of the bacteria present. Dr. Rob Dunn, Dr. Amy Grunden, Dr. Stephanie Mathews, Dr. Anne Madden and Lauren Nichols will be leading this project. After you wear the tiny bits of fabric they will identify the bacteria on the fabric and send you the results. This team will then use that information to answer questions about bacteria on clothing, bacteria associated with different types of fabric, and how these bacteria contribute to smell. If you don’t want to be one of those people, but would like to keep tabs on this project develops, you can also sign up here. Raleigh Area Residents Sign Up! Residents From Other Areas Sign Up for Future Study!